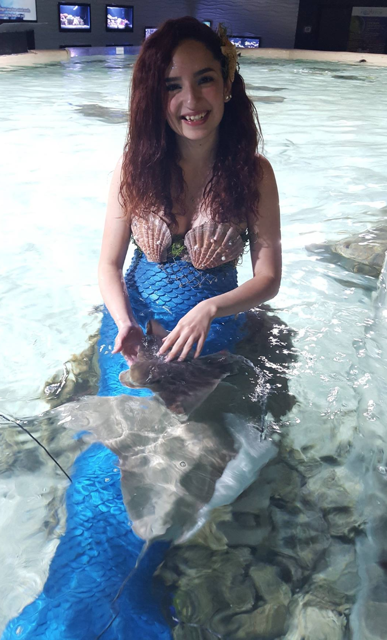 Meet our mermaid and go home with a selfie to show your friends! Sure, a lot of the creatures at the Austin Aquarium are exotic, but did you know we also offer mythical species? Come and take photos that your friends will never believe! Make your party extra-special. Call us and let us know if you desire to have one of our mermaids attend your party. $45 for for every half hour. Our mermaid can be the center of attention at any event or party you may have that is NOT at Austin Aquarium. Our mermaid will provide: Birthday t-shirt, Birthday badge, goody bags for all children (these goody bags have an admission pass), glitter tattoos. She will take photos with people. Inquire if you desire our Mermaid to swim in your pool. $150/hour. There is no cost for mileage within 5 miles of the Aquarium, after 5 it is $0.60 a mile. For parties further than 50 miles from the Aquarium, contact us for special mileage pricing. For any questions contact info@austinaquarium.com or (512) 222-5586. If you want more than one hour, contact us to make arrangements.